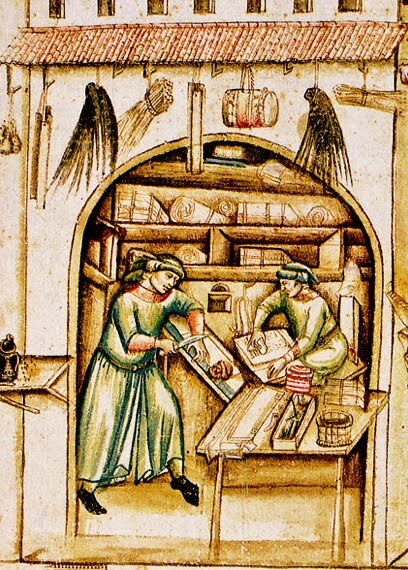 Parchment Sellers scrubbing & stretching the parchment 15th century Bologna, University Library. Cod. Bonon. 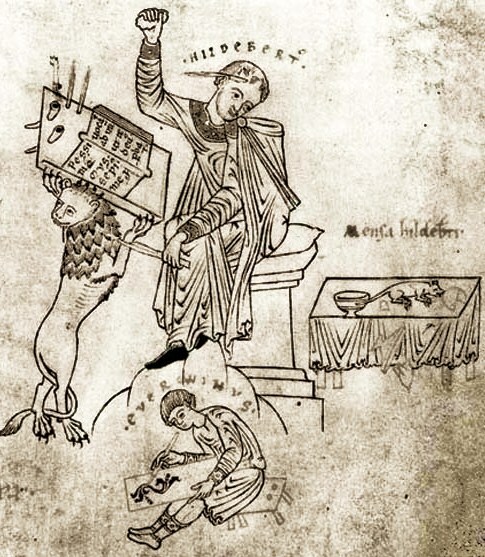 963, f. 4. 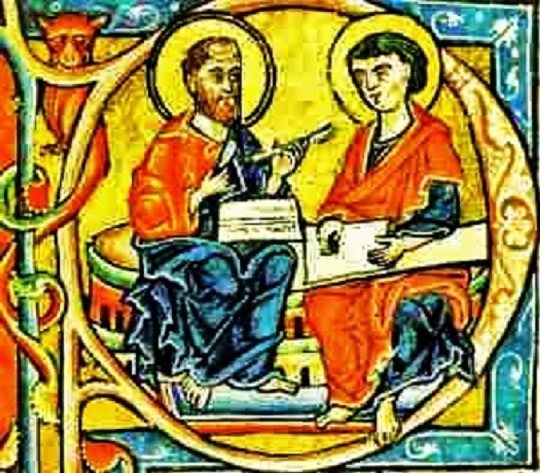 Manuscripts were hand-written & illustrated during the medieval era (A.D. 500-1500), before the invention of printing presses. They were time-consuming & expensive to make, however the method was quicker & much more portable than carving language symbols in stone or wood. 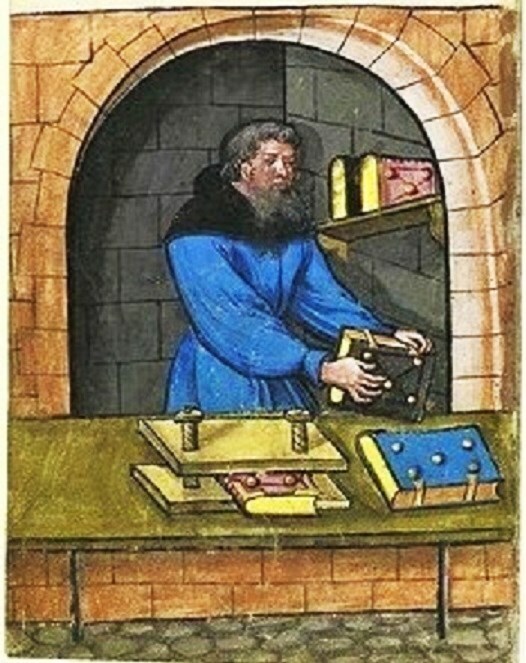 Scribe buying parchment Copenhagen, Royal Library. 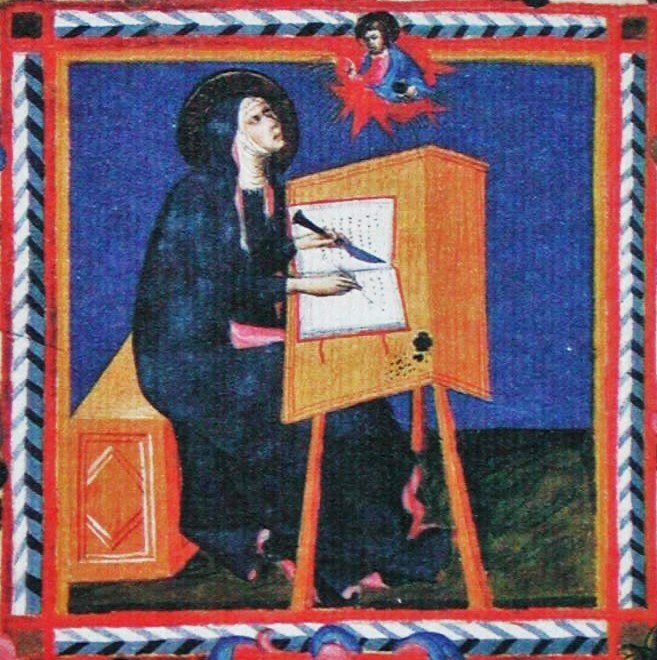 Ms. 4, 2o f. 183v. 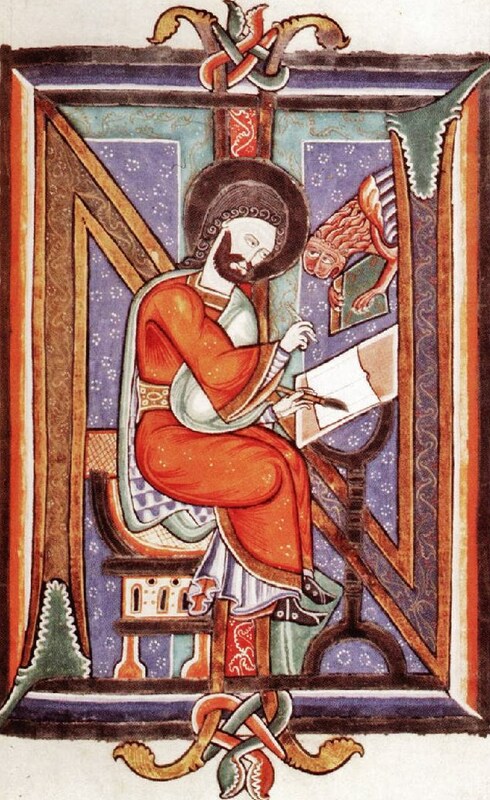 Manuscripts were usually written parchment or vellum made from the skins of sheep, calves, or goats. Parchment & vellum are terms often used interchangeably, although sometimes vellum refers to a finer quality of writing material. 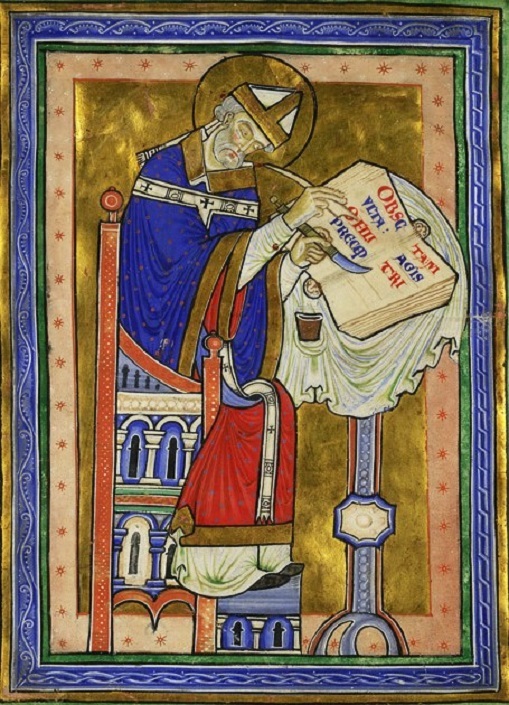 Parchment was eventually replaced by paper. 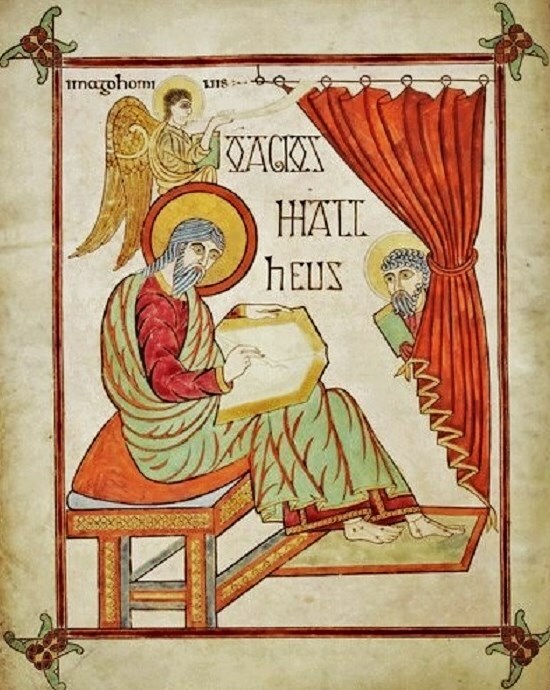 Some manuscripts were actually written on paper made from linen rags. 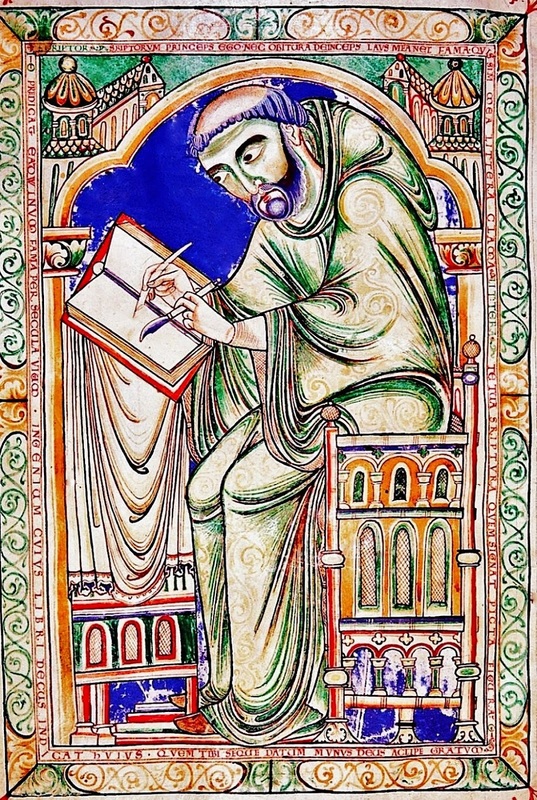 Often lines were ruled on the pages of manuscripts to guide the script writer. Some manuscripts were written on papyrus, a fragile Egyptian reed material, which continued to be used for manuscripts until the 7-8th-centuries. Papyrus plantations came to Sicily during the papacy of Gregory I (590-604) & papyrus was used for papal correspondence until the 11th century. 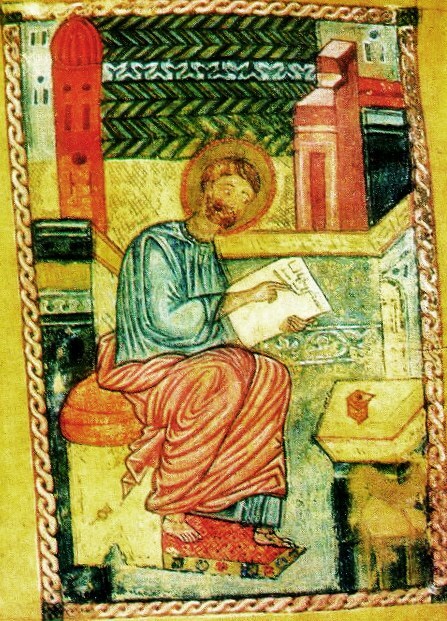 St Matthew ruling parchment 12th cent Dinant Gospels Manchester, John Rylands University Library. 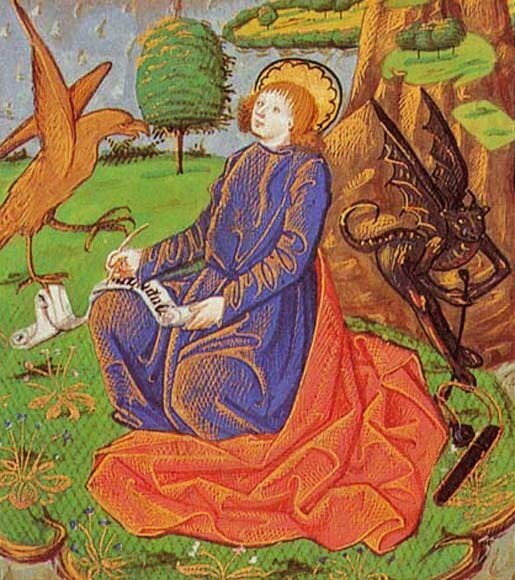 Rylands Latin Ms. 11, f. 14. 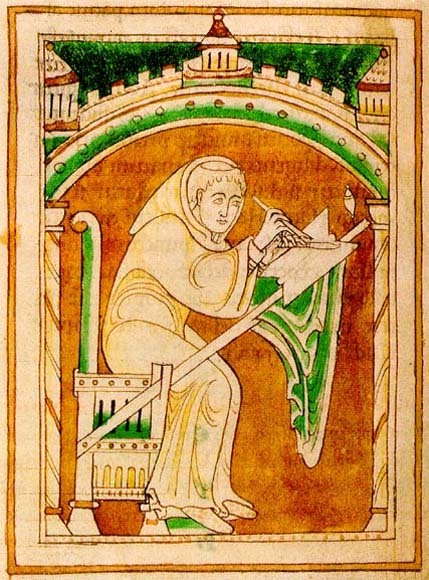 In the Early Middle Ages, the majority of manuscripts produced served as the liturgical books used by priests & monks in churches & monasteries. 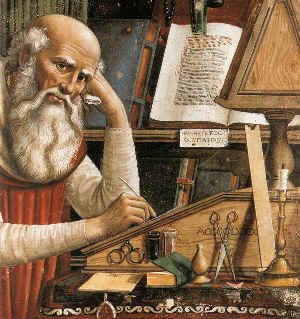 St Mark sharpening his quill in French Renaissance Book of Hours as a scribe Waddesdon Manor, Aylesbury, The National Trust. Ms 20, f. 13v. 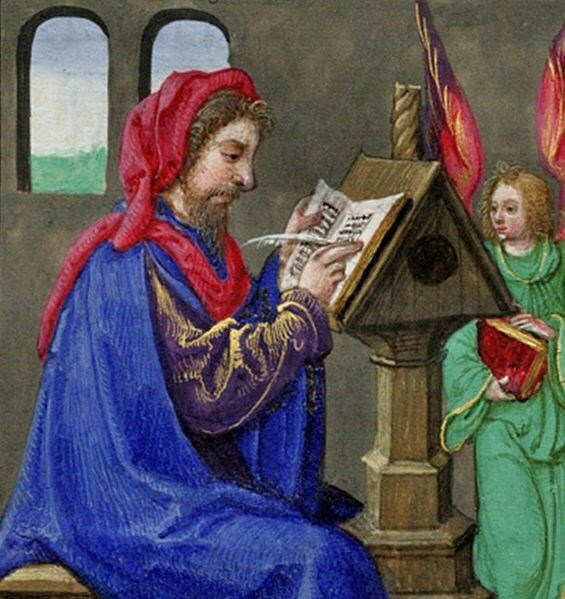 As the church expanded & new monesteries were built, more liturgical books were needed. 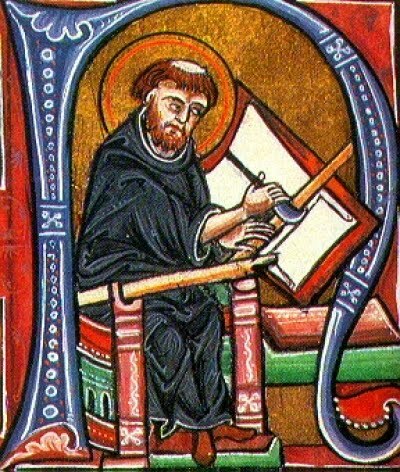 At new venues, the abbot or the monks initially came from an already established monastic community, which provided the most urgent books for the new site. 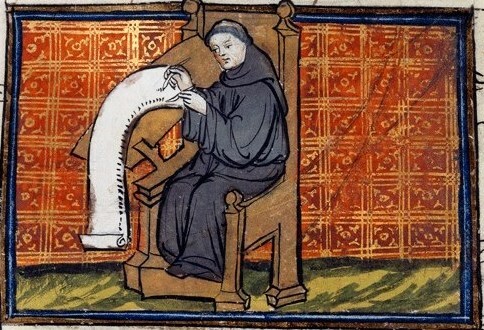 Immediately the monks began to copy necessary books for themselves. 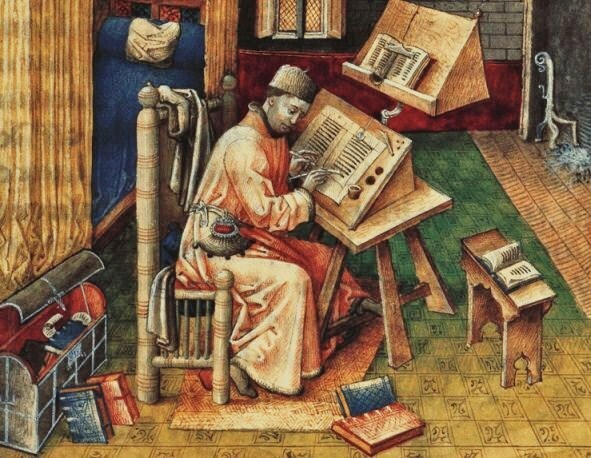 Medieval copyist monks, often called scribes, were responsible for copying the works of authors by hand. 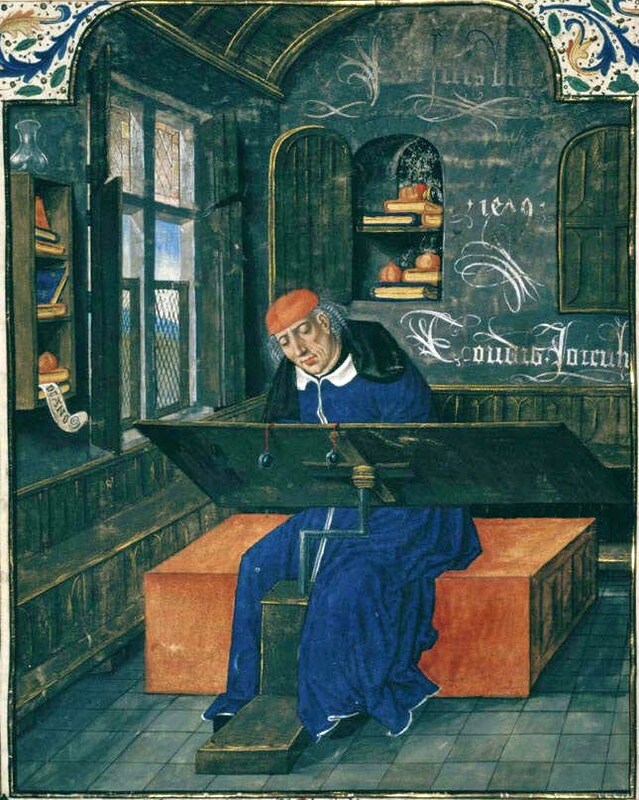 Jean Miélot, also Jehan, (d. 1472) scribe for Philip the Good, Duke of Burgundy from 1449-1467. 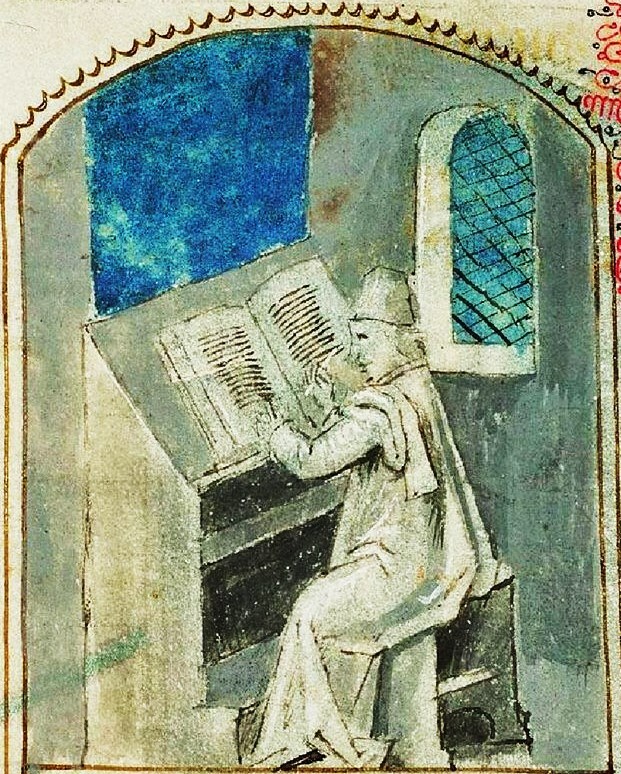 Paris, Bibliothèque nationale de France Ms. Fr. 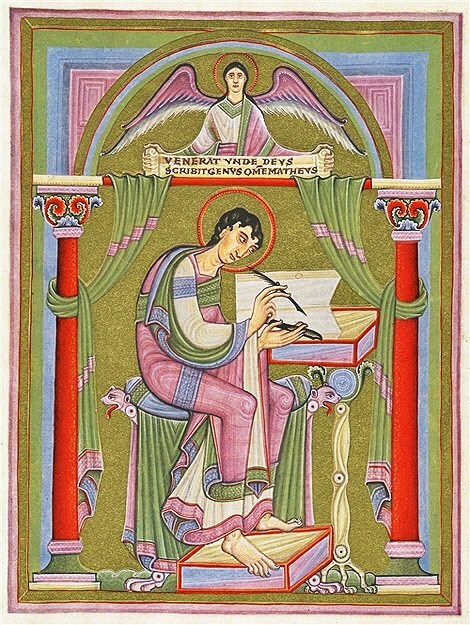 9198, f. 19. 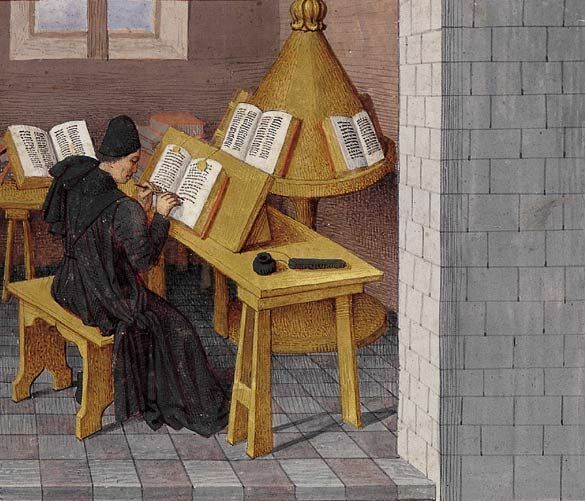 As early as the 1100s, books began to be produced for wealthy individuals as well as religious institutions. 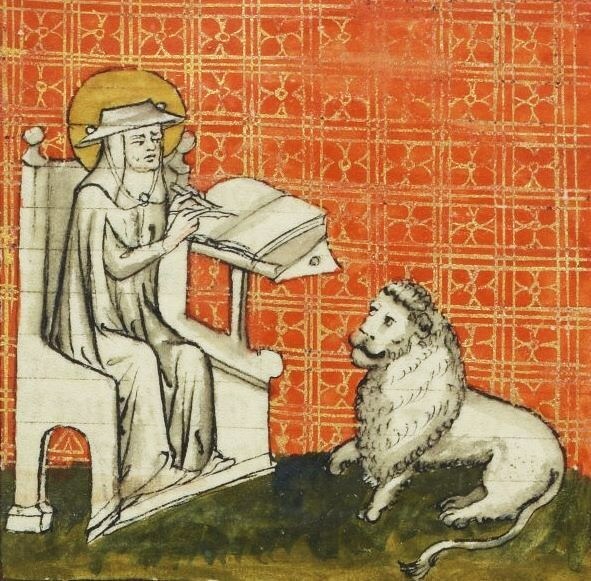 There began to be a gowing secular reading public demanding an increase in manuscript production. 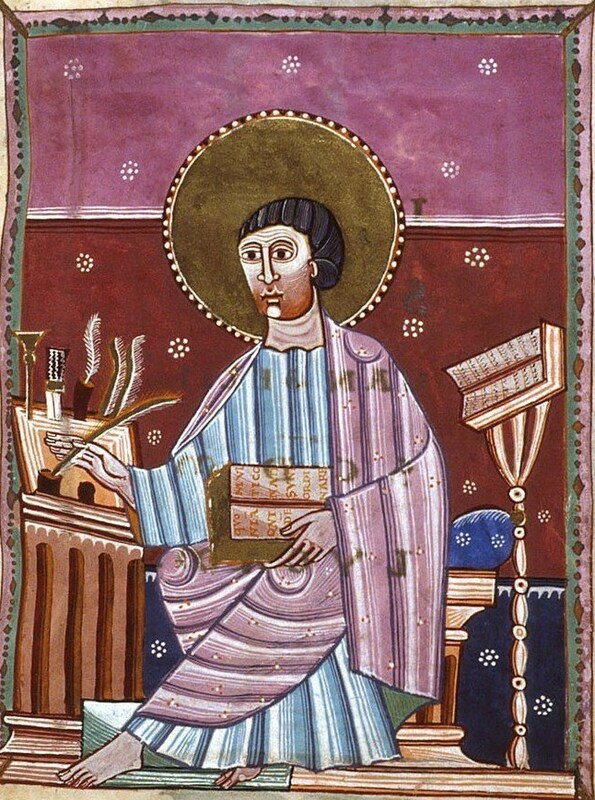 Because manuscripts were very expensive to make, they often served as status symbols. 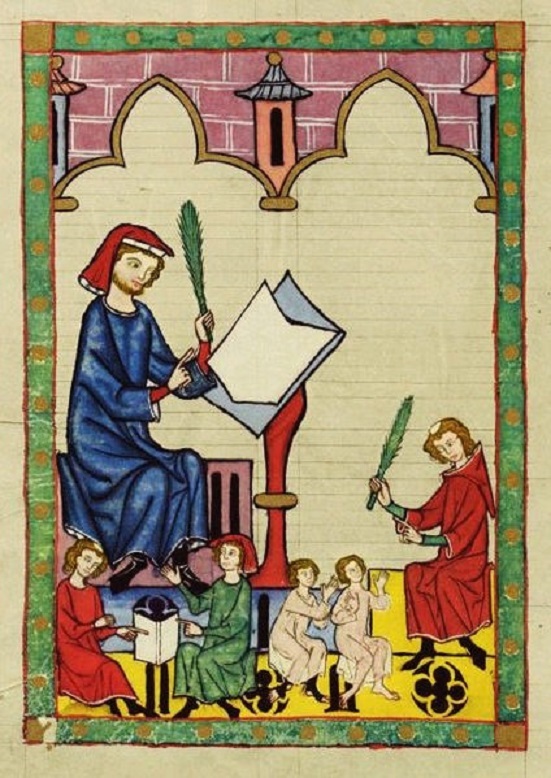 Most families who owned manuscripts held privileged positions in society. Initial letter G, from a manuscript produced in northern Italy during the early 1400s. 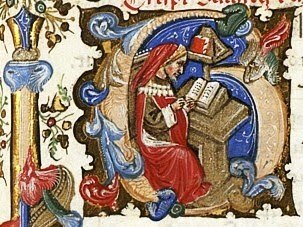 The major themes of manuscripts became more diversified as the secular readership grew and included the traditional religious (particularly Christianity) books plus new art subjects such as courtly activities, the hunt, gardening, & literarature. 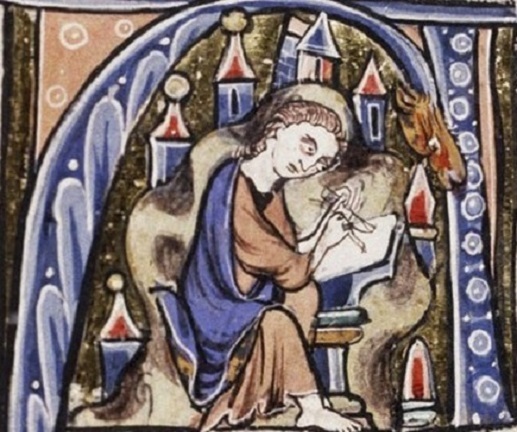 Eadwine the Scribe at Work. 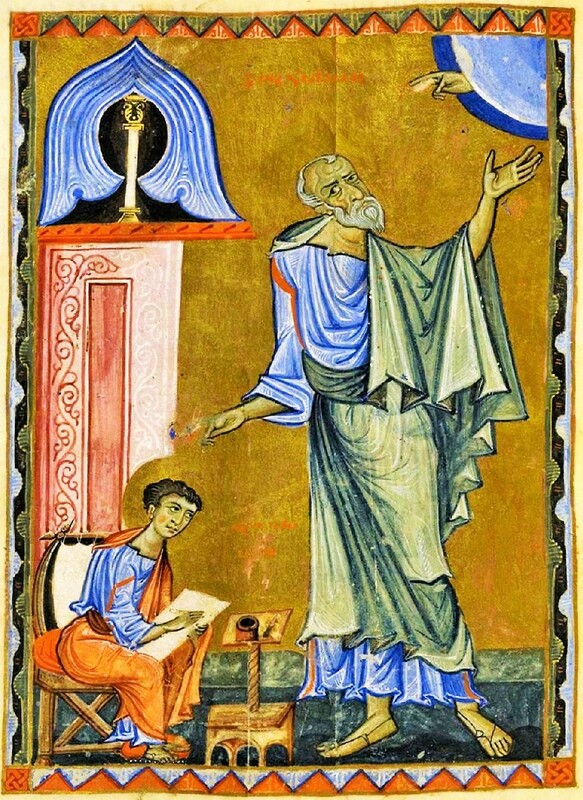 circa 1160-70. 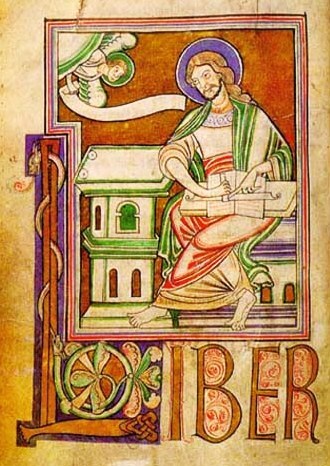 Eadwine Psalter. Christ Church. Canterbury (England) UK. 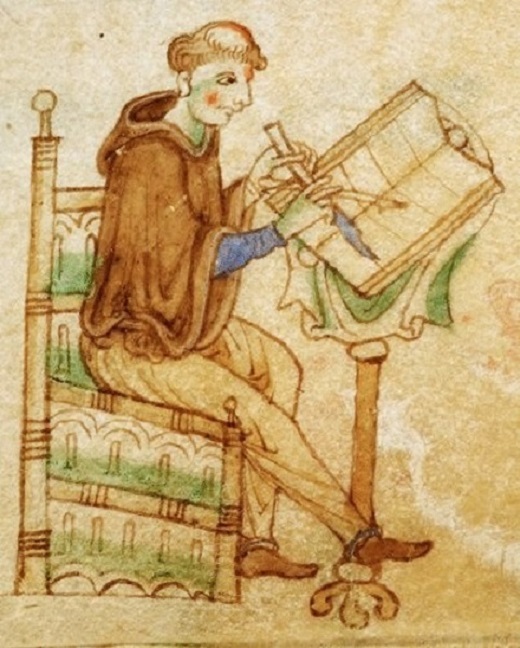 Laurence before 1149 as a scribe Durham, University Library. Ms. Cosin V. III. 1. f. 22v. 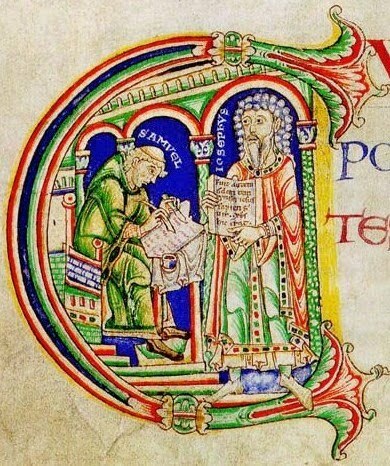 Josephus and Scribe Samuel Canterbury 1130 Cambridge, St, John’s College. Ms. A. 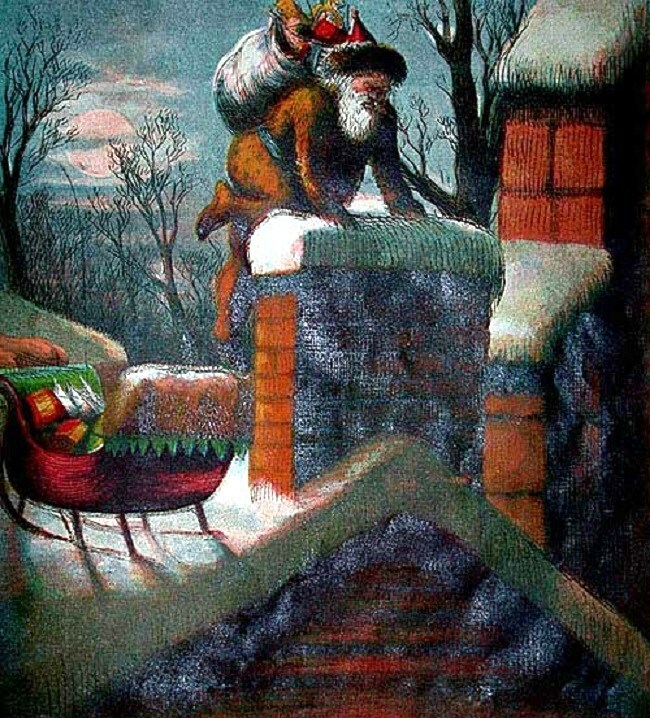 8, fol. 103v. 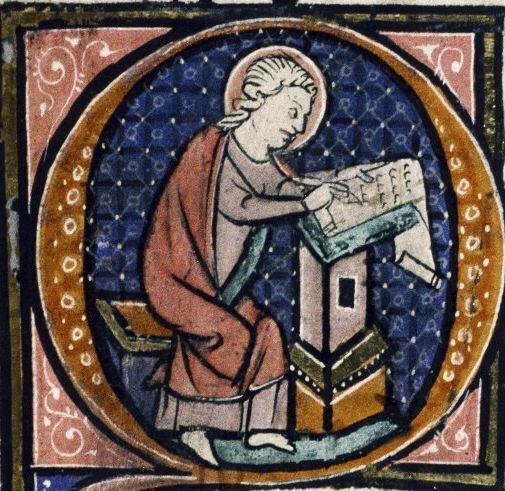 Apparently harried scribe writing & holding ink St. Matthew, from the Gospel Book of Archbishop Ebbo of Reims, Hautvilliers near Reims, c. 816 - 35. Bibliotheque Nationale, Paris. 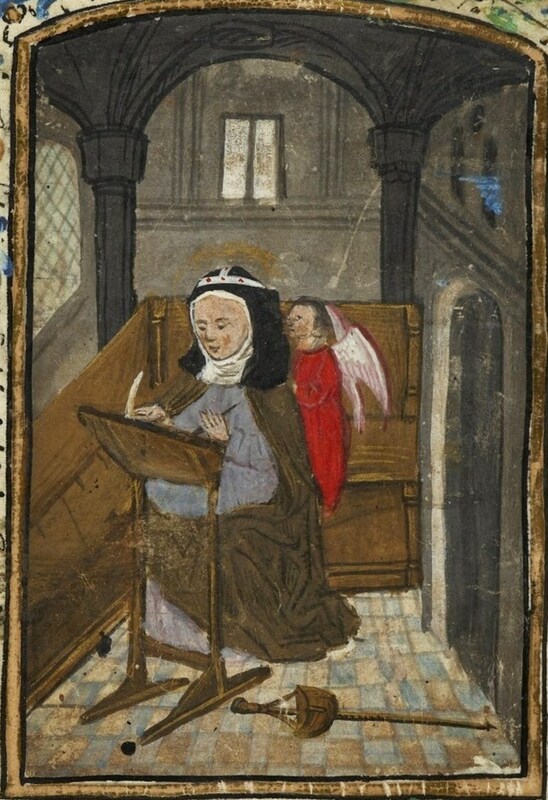 This scribe appears to have very little power. 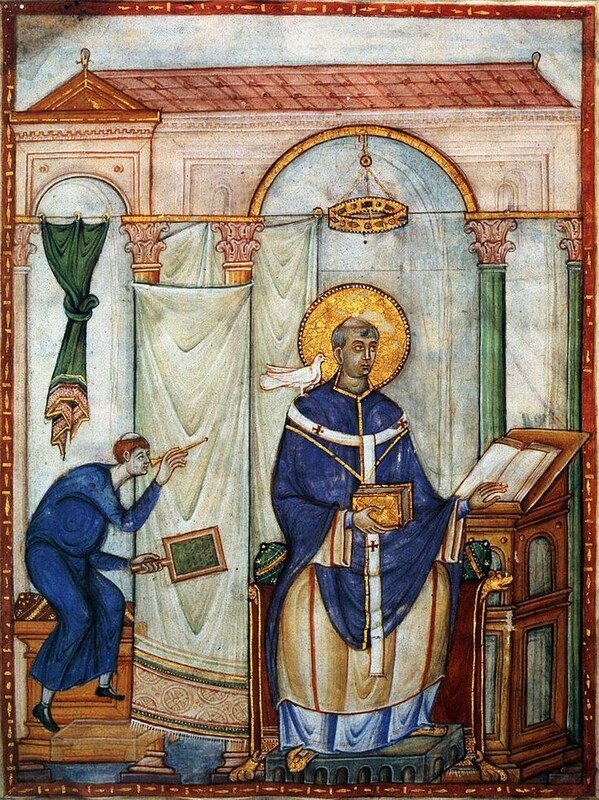 Augustine De Civitate Dei 1100s Apprentice Everwinus + Master Hildebertus Prague, The Metropolitan Chapter Library. Ms. A XXI-1. f. 153v. 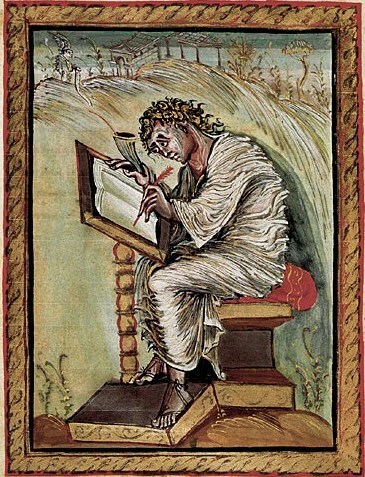 Organized scribe Ezra rewriting the Sacred Records with storage cabinet, from the Codex Amiatinus, Jarrow, early 8C. 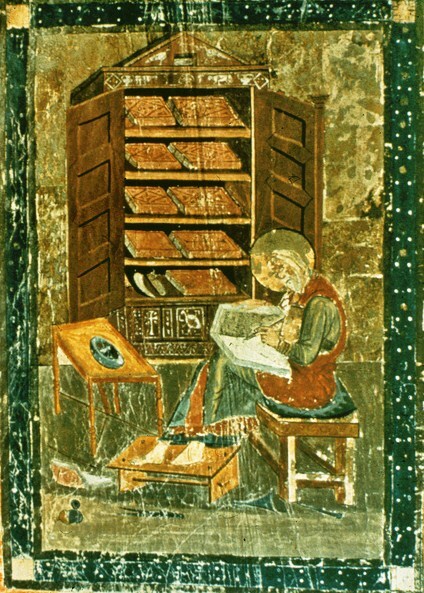 Biblioteca Medicea-Laurenziana, Florence. 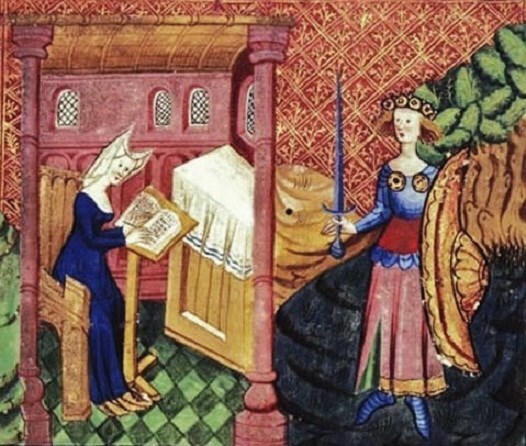 Christine de Pizan at work guarded by Justice with her Sword and Sheild 15C Between 1410-15, Christine de Pizan presented the Queen of France, Isabeau de Bavière, with a lavishly illustrated copy of her collected works. 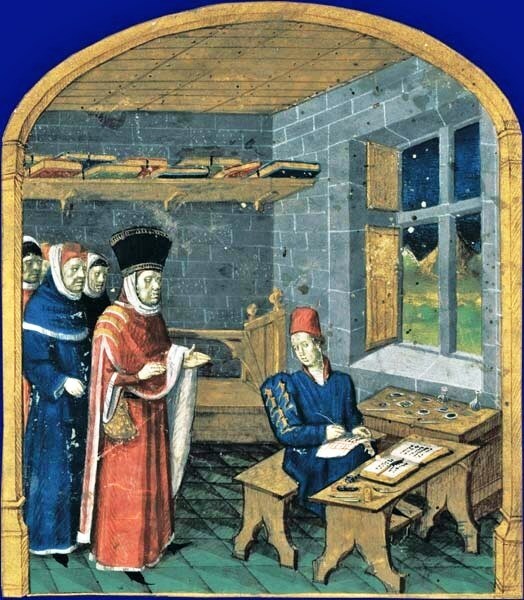 Christine de Pizan was attempting "to establish & to authorize her new identity as a woman writer." 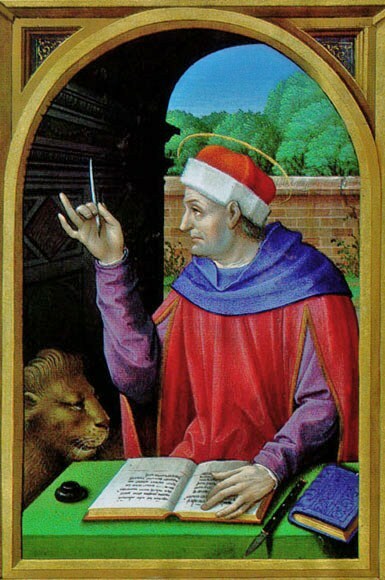 Christine, born in Venice in 1364, was the daughter of Thomas de Pizan, a respected astrologer. 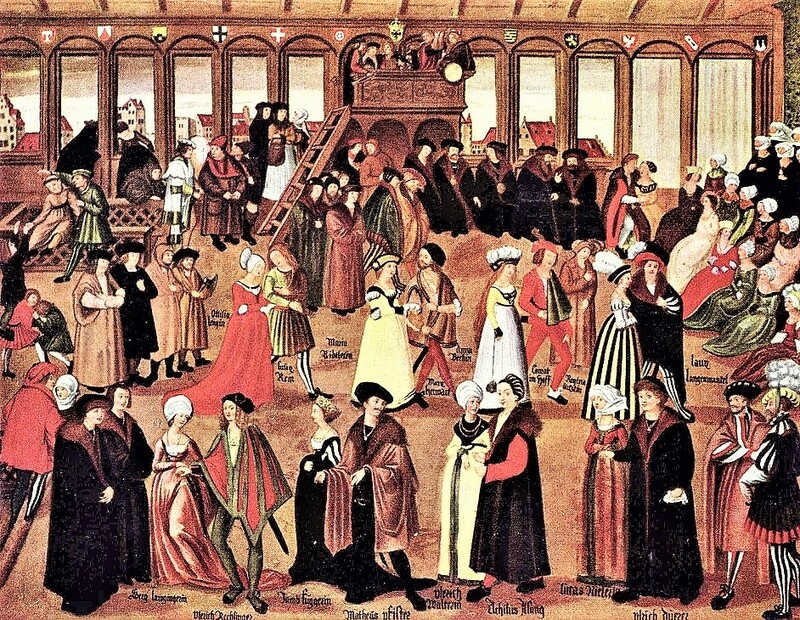 While still a child, she left her native Italy with the rest of her family to join her father who had taken a position as the astrologer & physician in the court of Charles V. At the age of 15, she married Etienne Castel, a young nobleman who served as a secretary in the royal chancery. With the deaths of her father & husband, Christine's secure position was gone. 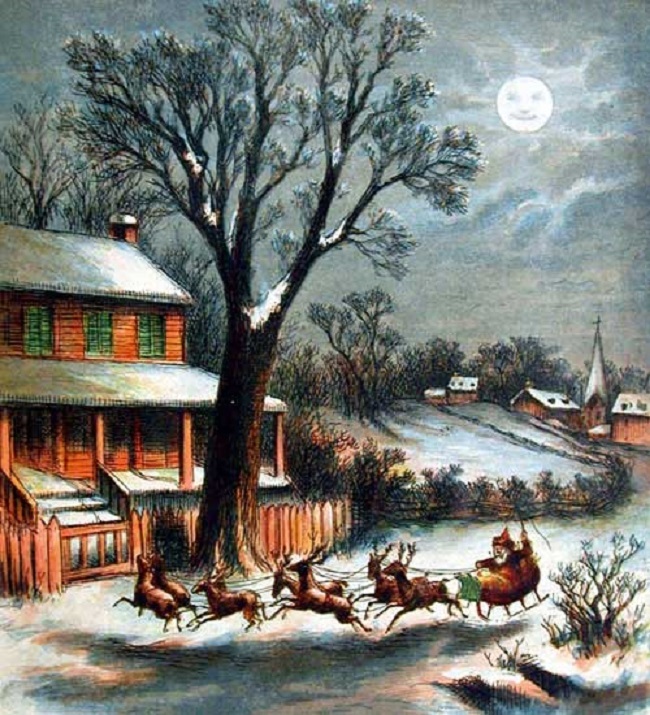 Later in her Livre de la Mutacion de fortune (The Book of the Change of Fortune), she was to describe her situation as being adrift on a ship during a storm. With the loss of her husband, she had to take the helm. She chose the role of the husband in the family. Christine resisted the usual solutions of remarriage or entry into a convent. 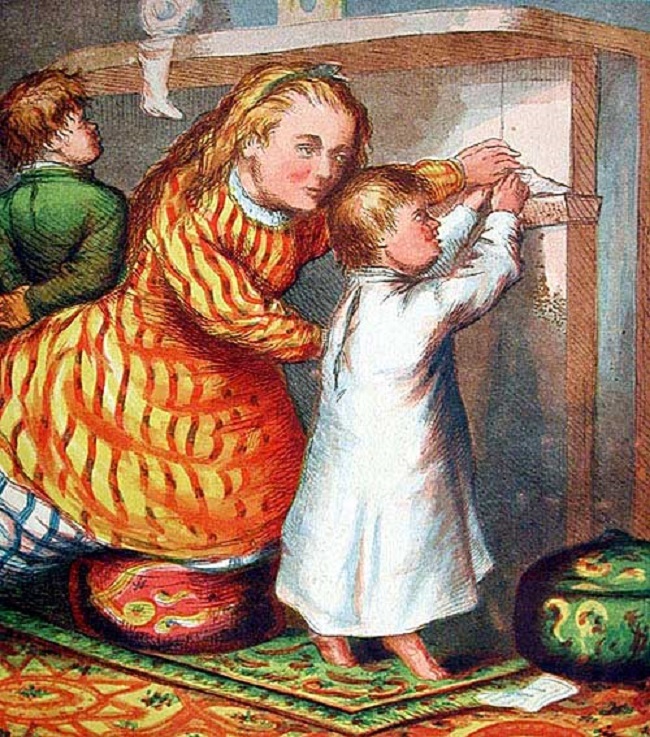 Instead she began a career as a writer. 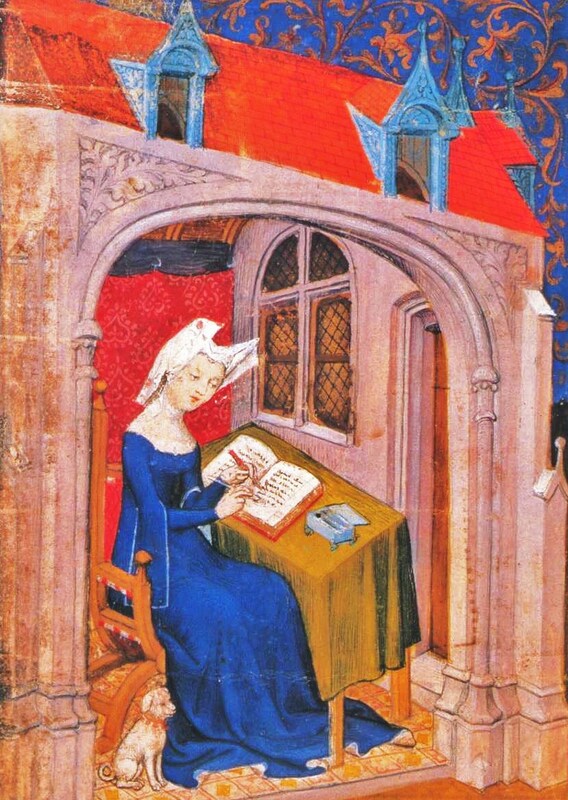 Christine de Pizan, 1st woman in western literature known to make a living from her work, writing a book. 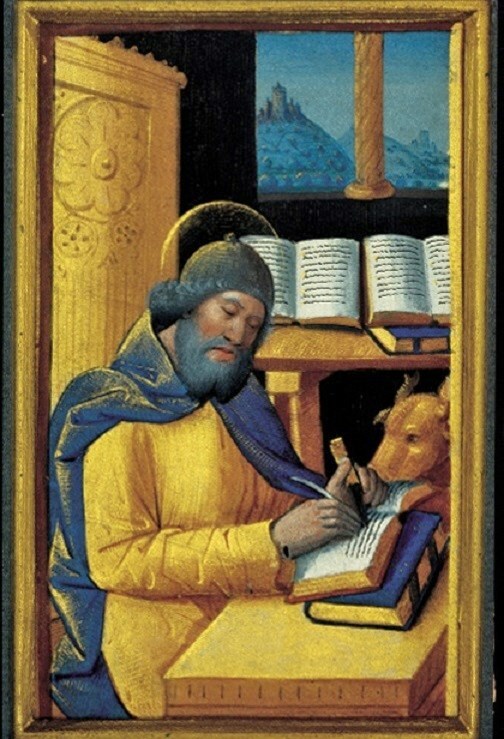 St. John writing at desk. MS. Laud Lat. 9, France, Ca. 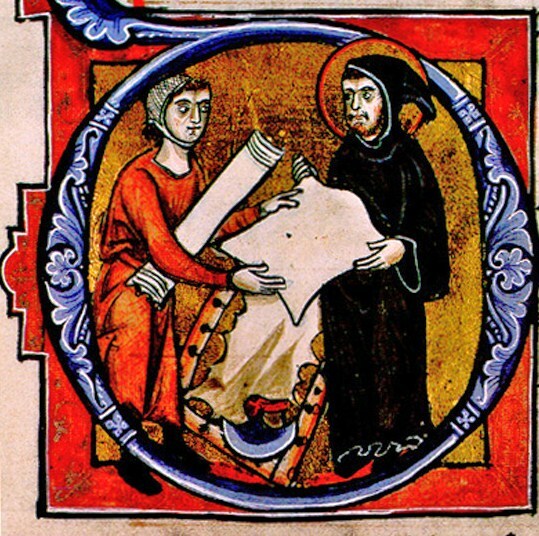 1220-1230. 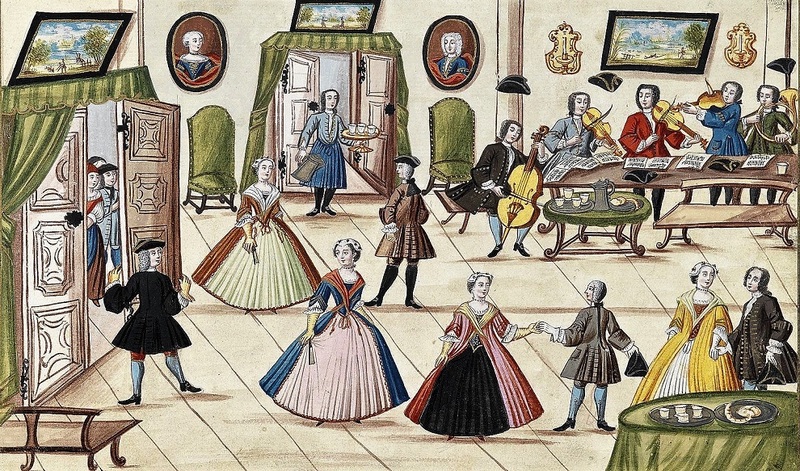 1736 A Ball by Johann Franz Hörmannsperger (Austrian, 1710-) The musician’s hats are levitating! 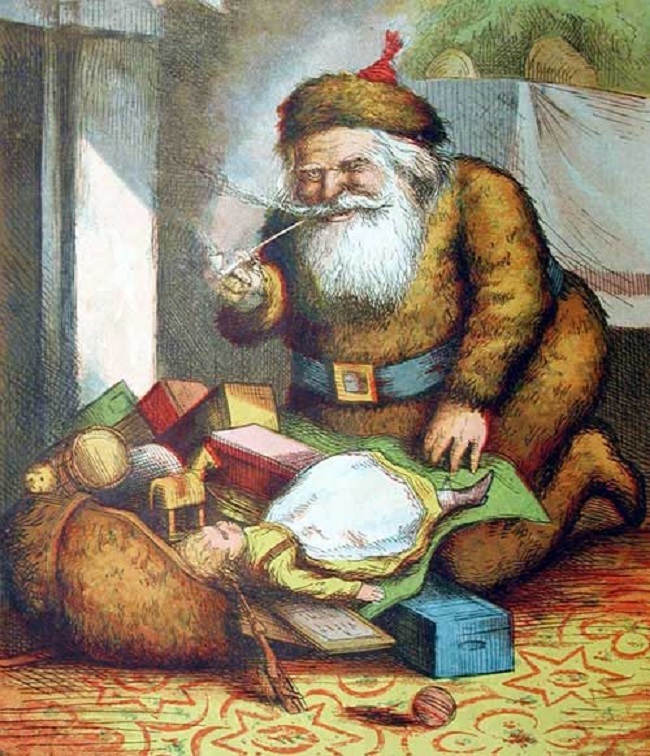 In The Anatomie of Abuses, Philip Stubbs – a pamphleteer – rails against aspects of popular culture that he believes are immoral and in need of immediate reform if his fellow countrymen and women are to escape punishment from God. 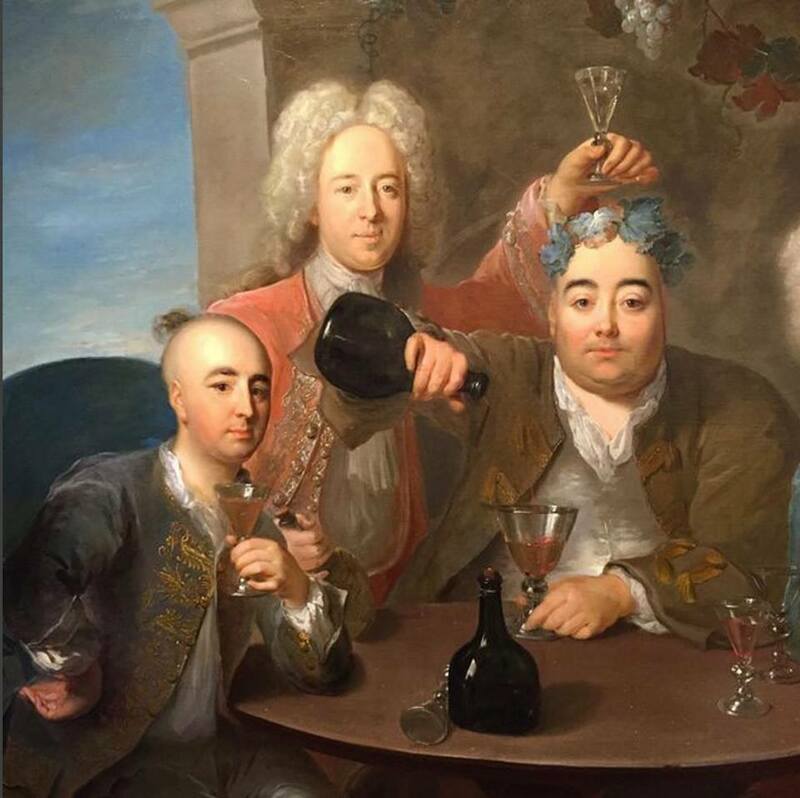 The subjects that come under his criticism include some expected transgressions – visiting prostitutes, lending money at interest, drinking and gluttony – plus others which are surprising – the wearing of fancy clothing, showy hats, the theater, sports, and dancing! 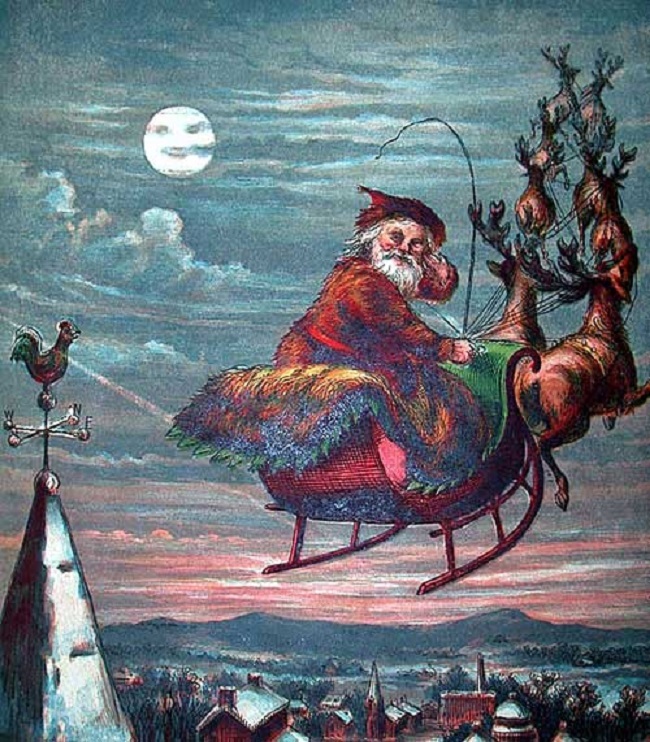 His work summarizes "Notable Vices and Imperfections, as now raigne in many Countreyes of the World: but (especiallye) in a famous ILANDE called AILGNA," (Ailgna is another name for England.) Stubbes has been described as a Puritan (or at least exceedingly puritanical); but records indicate, that he supported the established Church.